This started in Gillingham/Dorset around 30 miles from Salisbury. 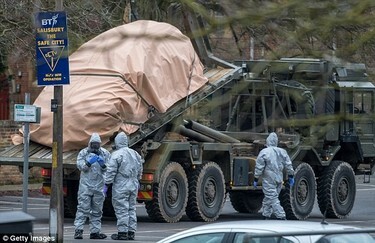 The army swooped on Gillingham to remove the vehicle related to the investigation of the poisoning by former Russian spy Sergei Skripal .In the area of Gillingham Mr Skripal was taken ill. The recovery vehicle will come and possibly remove a red BMW 320d car driven by Mr Skripal’s daughter ‘Yulia’. The BMW was at the centre of a probe into how the pair were poisoned by an unknown nerve agent. Experts claim that the double agent died after touching a smidge of a toxic substance on a door handle. A metropolitan police spokesman said “The public should not be alarmed and the public health advice remains the same.” The military has the expertise and capability to respond to a range of contingencies.